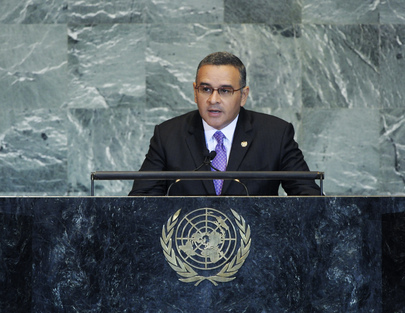 MAURICO FUNES, President of El Salvador, said the world was changing economically, socially and geopolitically. Today, more than ever, people were demanding political leadership to guide the international community through these uncertain times toward a more just, stable and secure future. Such changes created the opportunity to reconsider policies, change policies and create a new international agreement that calmed the fears and distrust of millions of people grappling today with unemployment, poverty, political instability, natural disasters and an unsecure future. “We must not betray the historical will for transformation and development,” he said. The fight against poverty and inequality was the greatest political and economic challenge of the day. “It’s time to stop seeing our future only in macroeconomic terms and to begin to focus the political debate on people’s needs for social justice,” he said. Organized crime and narcotic drug trafficking was the number one enemy, not only in Central America, but in much of the entire Western Hemisphere, he said. He likened it to terrorism that threatened countries. Many Latin American nations had unwillingly become corridors of illegal trafficking and were increasingly plagued by violence and corrupt institutions. Those countries, suffering from weak economies of scale, extensive poverty and inequality, were threatened by such an economically powerful form of terrorism. Drug cartels in Mexico and Central America had more money and influence than the region’s own Governments. “We are true victims of organized crime,” he said. Central American countries were undertaking sterling efforts to combat it, but they were no match for drug traffickers that moved $100 billion annually across their borders, leaving a trail of chaos and death. He asked how Central American countries, with limited gross domestic products (GDP), or even a large country like Mexico, could take on such an enemy. No nation was spared; drug consumption occurred everywhere. The fight against organized crime was a common struggle. He called on the United States to “lead with great resolve” and apply all its economic, human, technological and political resources to what was the “harshest” and deadliest war on the entire American continent. Latin American countries would do their part, by strengthening institutions, reforming security forces and working to keep youth out of criminal gangs. He noted strategies among Mexico, Colombia and the United States to fight drug trafficking. He stressed the need to also tackle money laundering, reduce armaments and improve the justice systems, noting that organized crime had infiltrated Latin America’s judiciary and police forces. But, consumer countries, like the United States, also had a moral responsibility to attack what was both a criminal and health problem. Turning to the United States blockade against Cuba, he said it was an anachronism, a step toward disunity and a stumbling block that weakened the continent. He called for its end.